With reference to the principles above, it was decided to reach a collection of 9,706 words in the final lexical list, where the majority of words are common in the three regions across the Strait and a small portion are words solely found in Hong Kong. There are 4,914 words and 4,792 words in Key Stage I (Primary 1 to 3) and Key Stage II (Primary 4 to 6) respectively. The distribution of the two Key Stages of learning is close to the two word lists made by Hong Kong and Beijing. There are 3,171 characters in the lexical lists, excluding those in the supplementary lists. 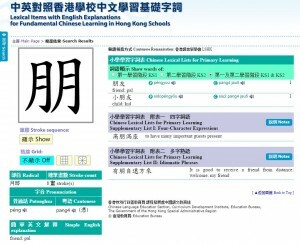 The results reflect the objective situation of language use in Hong Kong. As the coverage of various types of reference word lists is wide and the selection process has followed certain criteria, and the source of every entry of the list could be traced, the total number of lexical items is thus slightly higher than that of the List of Lexical Items for Teaching Reference in Primary Schools (1996), which should be appropriate in terms of quantity. 5,860 words of the word list are from the List of Lexical Items for Teaching Reference in Primary Schools (1996), amounting to 86.62% of the list. 2,461 Chinese characters are from List of Lexical Items for Teaching Reference in Primary Schools (1996) amounting to 97.97% of Chinese characters on the list; while 2,566 characters are from the List of Commonly Used Characters at Primary Level (1990), amounting to 98.69% of Chinese characters in the list. Researchers believe that the proportion of old and new lexical items basically fulfils the expectation of language educators in primary schools. It not only shows that the old and new word lists are along the same lines, but also reflects fully the language development and changes in Hong Kong in recent decades. The completion of the “Research on Hong Kong Chinese Lexicons for Primary Learning” has relied heavily on the concerted efforts of experts, scholars, experienced teachers and professionals from relevant organisations. During the research, I was deeply touched by the efforts of Prof CHOW Kwok-ching of Hong Kong Baptist University and Mr LEE Siu-tat, Mr CHENG Man-leung, Ms LAI Sau-mei, Ms SUN San-tak, Ms AUYEUNG Oi-ling, Ms Alice SZE Chi-wing, Ms Alice CHAN Suk-ping of the Education Bureau of HKSAR, all of whom participated in reviewing the materials, and by Ms TANG Mei-lan, Ms MOU Suet-fong, Ms TAM Kit-wai, all experienced language teachers who participated in the teachers’ focus group. We hereby express our sincere gratitude to the experts and consultants from Mainland China for their guidance and assistance, including Prof Fu Yonghe, Prof Chen Zhangtai, Prof Li Xingjian, Prof Tong Lequan and Prof Liu Yinglin. We also express a special thank you to the State Language Commission (國家語言文字工作委員會) and Taiwan’s Ministry of Education for their generous approval of the use of their lexical statistics.